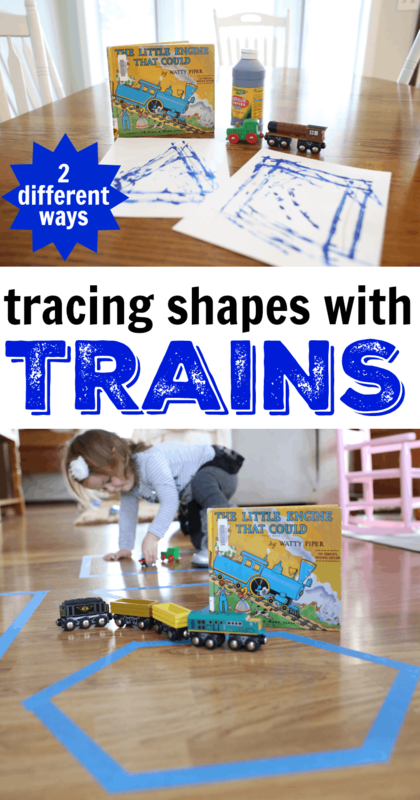 Tracing Shapes with Trains: The Little Engine That Could Activity - I Can Teach My Child! Happy New Year! We are starting the year off with a classic book for our Virtual Book Club for Kids: The Little Engine that Could by Watty Piper. Please note: I recommend that you test the tape on a small, hidden part of your hard flooring to make sure that it doesn’t take the finish off of your floor. I have never had any problems, but better to be safe than sorry! 1. Tear small sections of painter’s tape to create your shapes. I made a square, triangle, rectangle, hexagon, and octagon. Materials: Toy Trains, Paint, paper, and a permanent marker. 1. 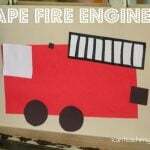 Draw simple shapes on the pieces of paper (we used cardstock). 2. Squirt some paint onto a plate and show your child how to dip the wheels of the train into the paint. 3. Start tracing the lines on the paper using the trains. I love how did several activities with the shapes! What an awesome way to combine shapes and trains! I love the giant tape paths! I love tracing shapes this way! Masking tape is the best thing ever! Fantastic – we’re working on shapes and I know my kids will love the paint version. Digging up my colored tape for this fun activity, can’t wait to try it out. Can imaging with a book playdate it would be a bit hit too!